On Sat­ur­day 6th Octo­ber, stu­dents from KES took part in the annual Mar­gate Rotary Club Swimathon. They were spon­sored to take part by friends and fam­ily, and the money raised will be donated to charity. They worked tremen­dously hard as a team swim­ming in relay as many lengths as pos­si­ble in 50 min­utes. Scar­let Par­nell and Maisie McLaughin man­aged an impres­sive 141 lengths as a team of two, break­ing the King Ethel­bert record to date. A huge well done to all! We wanted to say a huge thank you to you all for being your won­der­ful selves and help­ing to show the inspec­tors our bril­liant school and the fan­tas­tic KE school community. On Fri­day 5th Octo­ber Year 12 and 13 IB geog­ra­phy stu­dents went to Strat­ford to col­lect data for their inter­nal assessment. They vis­ited the Olympic Park, Lon­don Sta­dium and West­field shop­ping cen­tre in order to col­lect data on envi­ron­men­tal qual­ity, sphere of influ­ence and traf­fic counts, amongst other things. Whilst there, they com­pleted the Lon­don Sta­dium tour; the sta­dium is now home to West Ham FC. 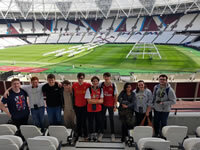 Even though the stu­dents do not sup­port West Ham they enjoyed the tour and even tried their skills on the indoor warm up track. The win­ners took their right­ful place on the podium and posed with Olympic medals. They all enjoyed the day. 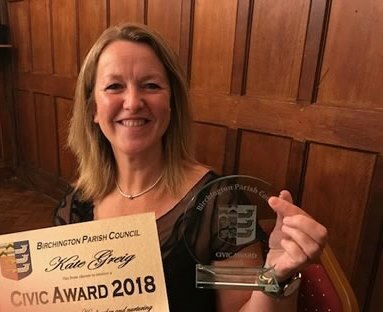 Kate Greig, our Head­teacher, has won a civic award for ser­vices to the com­mu­nity of Birch­ing­ton. Birch­ing­ton Parish Coun­cil pre­sented Ms Greig with a cer­tifi­cate for nur­tur­ing stu­dents towards a bet­ter future. This week, our staff are enjoy­ing lots of lovely baked treats while we raise money for Macmil­lan by tak­ing part in the World’s Biggest Cof­fee Morning. Every­one has done a fab­u­lous job of bak­ing (or buy­ing) lots of deli­cious things, and we look for­ward to see­ing how much we can raise for this very worth­while cause!